Before we get too far from the holidays, I wanted to share just a few more photos from Christmas Day. Blind Stella and Tanner weren’t the only ones trying to help themselves to boxes of goodies. We were surprised to find blind Bugsy had wandered into the living room, sniffed around, and quickly figured out that a particular?care package was stuffed full of dog cookies of one gourmet variety after another. 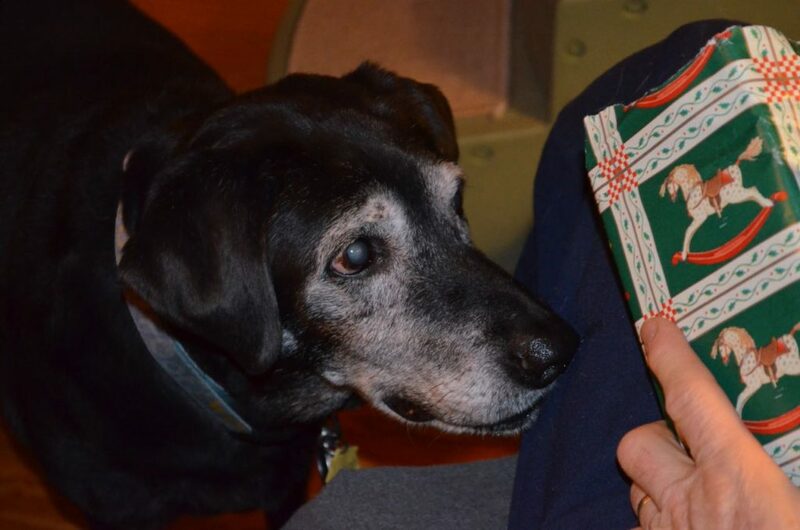 (This was a gift from Tracy W. in Vermont, who adopted blind Billy from us the previous December. Thank you, Tracy!) 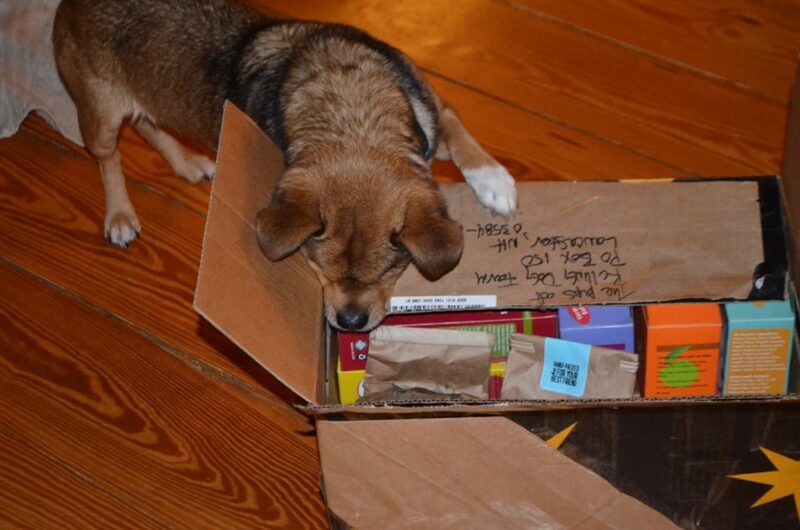 Bugsy’s nose must have been going crazy with all the different yummy aromas coming from that box! It’s a little hard to tell from this angle, but his front feet are almost off the floor because he’s resting his neck on the corner of the box as he leans in to see what’s there. In the upper right corner of that photo, you can see fluff from a new toy that Tanner had already shredded. I assured her I was doing fine just by myself and thanked her for her generous offer. What a sweet Christmas you both had! 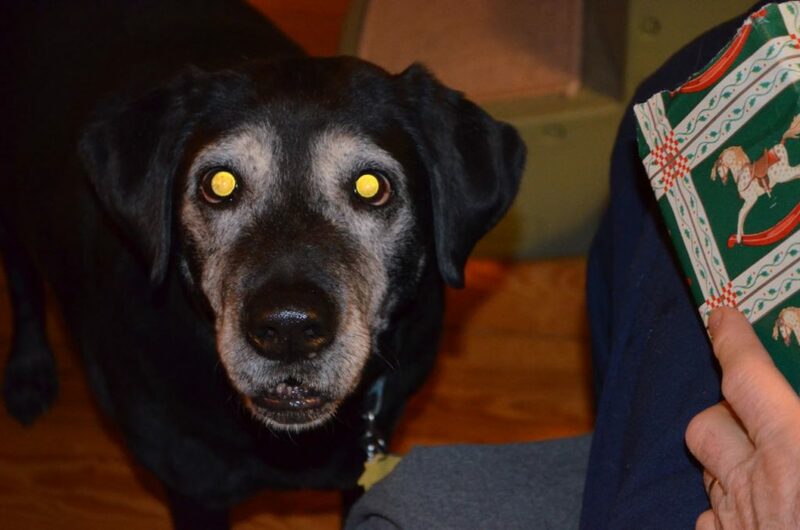 My dog Rascal (lab/border collie) was also very funny on Christmas Eve. After everyone had opened their presents, which he had been VERY interested in, I remembered his giant candy cane rawhide wrapped in tissue paper – well his eyes got so big and he started barking and tore into that baby like crazy – he carried that around all night knocking things over with it. He was the life of the party! Happy New Year to you both! The photos of Stella are so nice. I love the one where she heard the click and looked right into the camera. I hope Bugsy got to choose his favorite treat first since he made the effort to check out the good smells. 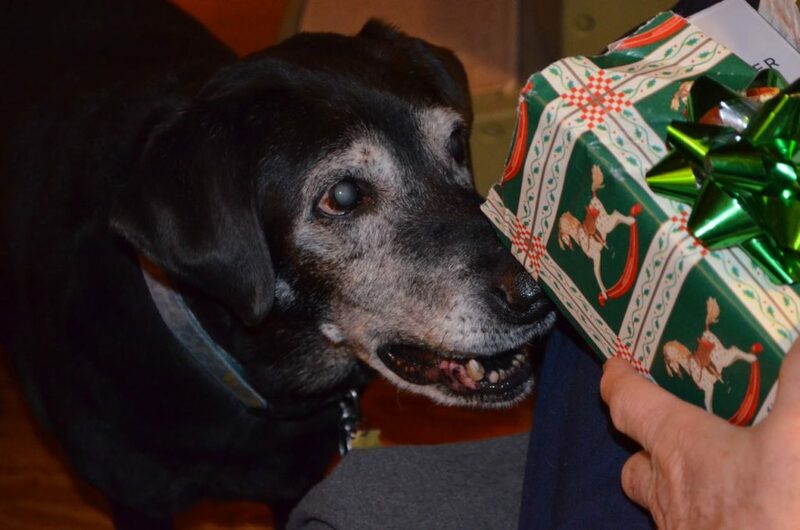 Seems like the RDF crew made out well this Christmas – Santa Paws was good to them. Oh, and nice shredding, Tanner!! I hope you save some of the toys for your friends. I wonder if all the RDF pooches count the days until each Christmas just so they can indulge in treats and toys even more than usual. Such a cute shot of Bugsy. He showed admirable restraint, too. 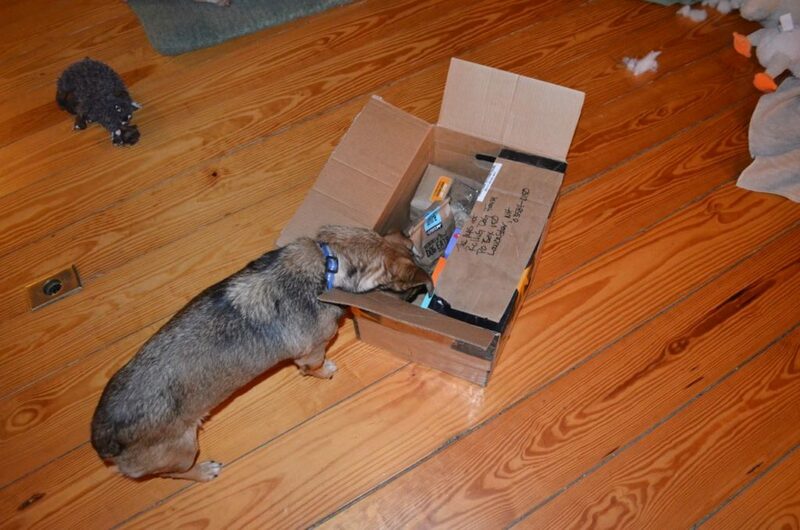 Many a dog would have helped himself to one of those wonderful-smelling packages. And Stella looks like such a sweet girl. Really sweet, precious pictures – and Christmas memories to last til next year! Happy New Year to you and all of the pups!